At the base of a sacred volcano in an isolated corner of the South Pacific young men play the "Star Spangled Banner" on bamboo flutes. Every February they parade in old US army uniforms with wooden weapons. Others go bare-chested with the letters "USA" painted in bright red letters on their bodies. Nearby, a giant Stars and Stripes flutters in the breeze from the main flagpole. 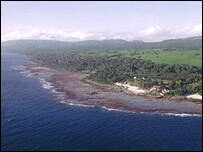 This is the heart of John Frum country on the island of Tanna in Vanuatu. Villagers at Sulphur Bay worship a mystical figure who they believe will one day bring them wealth and happiness. "John is our god," declares village chief Isaac Wan, who beats his fists into the ground to emphasise his words. "One day he will come back," he says. 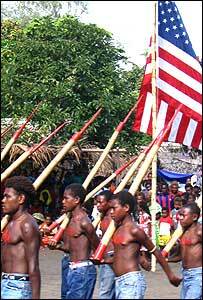 Believers are convinced that John Frum was an American. The name could well have come from war-time GIs who introduced themselves as "Jon from America." Devotees say that the ghost of a mystical white man first appeared before tribal elders in the 1930s. It urged them to rebel against the aggressive teachings of Christian missionaries and the influence of Vanuatu's British and French colonial masters. The apparition told villagers to do all they could to retain their own traditions. Anthropologist Ralph Reganvalu told the BBC that the sect was a "cultural preservation movement" that was born during a time of upheaval. "There was a whole period in history known as Tanna Law where the missionaries put in this series of rules about what people weren't supposed to do and the movement emerged because of this oppression," he said. World War II and the arrival of US troops on Vanuatu was a defining time for the movement. They had a name for their spiritual deity. He was John Frum. Villagers believe that their messiah was responsible for delivering to them the munificence of the US military. They were awestruck by the army's cargo of tanks, weapons, refrigerators, food and medicine. John Frum day is held annually on 15 February. This year's celebration marks the 50th anniversary of the sect's formal establishment. It also recognises the day when villagers raised the US flag for the first time. Through this homage to the US, disciples hope their ethereal saviour can be encouraged to return. "It's a little bit weird but it makes me feel really patriotic," said Marty Meth, a retired businessman from New York, who had travelled to Tanna to see the festivities. "It's really nice to see Americans welcome here since in so many places in the world we're not so welcome these days," he added. 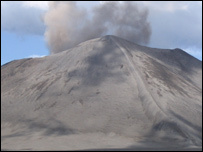 Sulphur Bay lies in the shadow of Mount Yasur, an active volcano whose roar can be heard far away. Many followers of John Frum believe his spirit lives deep within the volcano. Every few minutes Yasur bellows. Watching and listening from the crater's edge is both exhilarating and frightening. A deafening growl is followed by the blasting of molten rock high into the sky. These rumblings are a constant reminder for villagers that the spirit of John Frum remains as potent as ever. 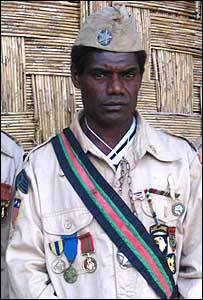 About 20% of Tanna's population of 30,000 follow the teachings of one of the world's last remaining cargo cults. Other islanders can barely disguise their contempt for it. A Christian youth worker told me how he thought the cult was childish. "It's like a baby playing games," he insisted. "Those people are holding on to a dream that will never come true," he said. I put this view to Rutha, who's married to Chief Isaac's son. She was unfazed. "I don't care what they think," she says gently without a hint of displeasure. "John is our Jesus and he will come back." The John Frum Movement is still trying to entice another delivery of cargo from its supernatural American god. In the meantime his disciples continue to wait and hope.